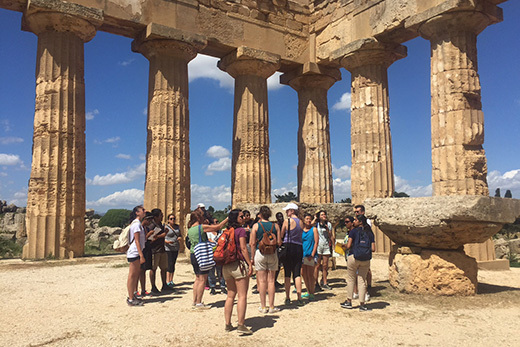 Students from the Emory Italian Studies Program visit one of the ancient Greek temples at Selinunte in Sicily on the day they learned of the Orlando tragedy. Photo by Don Batisky. The Emory Italian Studies Program offers students a unique and intensive immersion into Italian language and culture, literature, art, history, religion, healing traditions, cultural mores and current events. Program participants engage in interdisciplinary study of Italy through the ages, incorporating the perspectives of Italian cultural interdisciplinary studies and medical humanities with the special participation of faculty from the Center for Ethics and from Schools of Medicine and Public Health. Students of all academic disciplines investigate notions of compassion, mercy and charity as civic and religious virtues illustrated through Italian history, art, literature, social institutions, current events and daily life. This year's trip began May 17, with students set to return June 29. Hosted by the Department of French and Italian and the Italian Studies program, the Emory Italian Studies Program is directed by Judy Raggi Moore, professor of pedagogy in Italian. Editor's note: In this column, Emory professors Ruth Parker and Arri Eisen reflect on the Orlando shooting and the discussions it sparked for students participating in the Emory Italian Studies Program, who learned of the tragedy while studying in Italy. The night before we had watched in awe as the evening sun slowly sank into the horizon, with the ancient Greek temples of Selinunte in Sicily magically silhouetted against vibrant glowing reds, yellows and pinks. Then the mass murder and all our students’ eyes lower together, like suns going down, as we pause less than 12 hours later to reflect, console and wonder. Eyes don’t lie. And the question about fate. We are a couple dozen — undergraduates from across the disciplines, medical students, and professors from biology, ethics, medicine and Italian studies. For nearly a month we’ve been tracing the arc of Western civilization’s history through Italy — the Etruscans, the Ancient Greeks, the Romans, the Byzantines to the Renaissance. The trip is full immersion liberal arts with the weave of religion, science, art — discover and rediscovery — Plato, Boccaccio, Vitruvius, Michelangelo, da Vinci, Galileo. The great themes of death and dying; beauty, balance and harmony; fate and the soul; health and healing; compassion and communication. Now this: tragedy as a teachable moment, gathered in a half circle and caught in that surreal space, far from the deaths in Florida and far from our loved ones, huddled in a forced, almost guilty solidarity. The eyes going down. That afternoon, Judy Raggi Moore, the Italian scholar who directs our experience, will lead us through this sleepy, impoverished seaside town’s soul — its archeological park — and we will stand before its majestic temples and discover more of who the people were and what they thought as they built this magnificent and powerful ancient city, now laid low by time, epic battles and a massive earthquake. The students will draw, discuss and wonder at the confluence of math, science, engineering and philosophy intersecting to render beauty. We encircle the bronze Efebo di Selinunte, now prominently displayed in the park’s small museum. In previous years he was missing — stolen, then found, in repair, and now he is home. We study his human form and speak of its semi-circles, triangles, and of observation and the beauty of humans. The Greeks understood. His eyes — semi-circles above, semi-circles below — stare straight, do not lie. Nor do the downcast eyes of our students. Da Vinci goes inside the eye, cuts it open, sees its connections to the brain, sees perspective as a "function of the eye." Galileo turns his toward the heavens, removes humans from the center, extends our vision. We had discussed with our students the perhaps apocryphal tale of those men of the 1500s on Galileo’s roof refusing to look in his telescope for fear of the foundations it would shake in their world. See. Raise up your eyes, we tell our students. There is resonance with Plato’s Academy, its study for citizenry. Our students represent the historic and distinct diversity of the 21st century classroom: a black Southern Christian who will be a professor of history; a Muslim from Orlando, uncertain and frustrated by his forced reality, working toward his MD; first-generation college students with parents from Laos, Kenya, and South America; a Korean whose parents are Christian who has moved toward Buddhism; a second generation Indian Hindu from Colorado. The courses we teach are Italian Culture and History; Medicine & Compassion; Science, Religion and the Nature of Evidence. We share and analyze the Greeks and the Renaissance, Selinunte and Orlando, through the lenses of our disparate histories and cultures, disciplines and experiences. We decide as a group after our reflections on Orlando to continue with the planned course discussions of the day, to include the tragedy in our thoughts and academic discussions, readings and writing. We look in the telescope. We use our cultural engagement and immersion in this cradle of Western thinking to collectively look within and without. Can we make meaning as a community of scholars and citizens — meaning that can lead to action and change? See. Ruth Parker is a physician and professor of medicine, pediatrics and public health. Arri Eisen is professor of pedagogy in biology, the Institute for the Liberal Arts and the Center for Ethics.